Dr. Kathy Ranzinger is the owner of East Valley Animal Clinic. She purchased the clinic in 1995 when it was located within the East Valley Plaza strip mall. In 2001 a new building was erected at our current location. It has grown from a 1 Doctor, 1 technician and 1 receptionist to a 5 Doctor and 15 technician practice. Dr. Ranzinger is very proud of East Valley Animal Clinic, especially the staff. "It is very rewarding to provide a respectful, pleasant work environment where we can all grow together as a team." Dr. Ranzinger lives with her husband Dave on a small hobby farm in New Prague. They are raising Angora goats for their mohair and chickens for their eggs. They also have 4 dachshunds, 1 great Pyrenees guardian dog, seven cats, 3 parrots and one parakeet. Mary Jo Wagner was a certified veterinary technician for over 20 years before she returned to school to earn her degree as a Doctor of Veterinary Medicine at the University of Minnesota School of Veterinary Medicine in May 2005. During her years as a veterinary technician, she worked in several different small animal practices, including the Animal Emergency Clinic in St. Paul, MN where she gained skills in emergency medicine. Dr. Wagner was also a faculty member at the Medical Institute of Minnesota where she trained vet. tech students. She has a special interest in small mammals such as guinea pigs, ferrets, rats and mice. Dr. Mary Jo Wagner and her husband have 2 adult children. They also share their home with their two dogs Walter and Alice, and their 4 cats Lucy, Petey, Pickles and Barney. In her spare time, she keeps busy with home improvement projects and gardening. 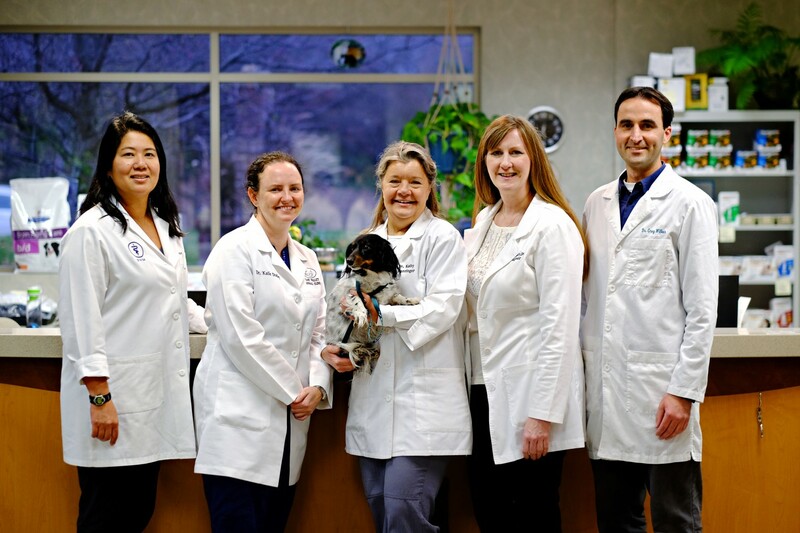 "Making the transition to a new clinic was made easier by the great staff and clients of East Valley Animal Clinic"
Dr. Pam Takeuchi joined the staff in June 2005 after moving to the area from Plymouth, Minnesota. Dr. Pam is a 1999 graduate of the Ohio State University Veterinary School. Originally from southern California, living in Minnesota has been a change. Winter mountain biking and cross country skiing have ensured that the winter months go by a little quicker. During the summer months, she is busy mountain biking around MN. Her husband Ken, and their 2 sons, Kyle and Owen, and their dog, Yuki also ensure that Dr. Pam never sits around for too long. Dr Katie Dudley is a 2003 graduate of the University of Minnesota College of Veterinary Medicine. She worked at East Valley Animal Clinic from 2003 until July of 2007 when she moved to Baltimore, MD. Missing Minnesota, Dr. Dudley moved back "home" in December 2008 and was very excited to be able to return to EVAC in January 2009. She enjoys dermatology, feline medicine, and getting to witness the bond between clients and their pets. Currently, Dr Dudley lives in Minneapolis with her Standard Poodle, Walter, and 2 cats, Harry and Sally. In her free time she enjoys walking with Walter, reading, yoga, and attempting to knit and crochet. Dr. Wilkes graduated from the University of Minnesota, but this isn't his first career. He started out with a degree in business, but wanted something more hands-on, so he trained as a carpenter. He found enjoyment as a cabinet maker because of the attention to detail that is required. But as time went on, he realized his real passion was caring for animals, which led him to vet school. Dr. Wilkes' family moved a lot when he was a child, but he has spent most of his adult life in Minnesota and loves the outdoors here. He especially loves the water, enjoying boating, kayaking, and camping in his free time. He enjoys woodworking and automotive work. He has a special interest in dermatology, ophthalmology and helping geriatric patients enjoy their golden years.